You're not planning to move anytime soon, so the decluttering process can wait, right? Actually, the time to start is as soon as you finish reading this post. Reducing clutter has become a popular lifestyle trend. Paring down your possessions can give you a welcome sense of freedom, and you won't be under the gun when moving time comes. Throwing clutter in the trash should be your last option. Most of your excess items can be either donated or sold. 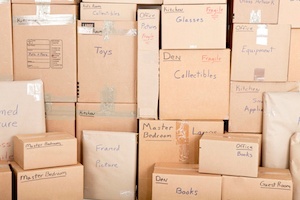 Set up separate boxes or trash bags to sort items accordingly. If you start randomly tossing things, you'll get nowhere. Take a section at a time, whether it's one room or one closet, and complete that area before moving on to the next one. This method also lets you stop when needed and pick up where you left off. This is a classic trick for tackling big projects. Establish goals, such as finishing the kitchen by a certain day, and give yourself small rewards like watching a movie or getting a manicure. Do you hang on to sentimental items but keep them packed away where they're never seen until you move? If they aren't serving any purpose, pass these items along to someone who will receive joy from them. Then there are those items you keep for the wrong reason: they hold bad memories. Don't even think twice about tossing them. You'll feel a welcome sense of lightness once they're gone. Don't feel up to wading through all the clothes in your dresser? Conventional wisdom says that items used more frequently will stay at the top of the drawer, so simply pull out the clothing at the bottom third. We all have those damaged and broken items that we mean to fix "sometime," but they end up sitting around collecting dust. If it's been six months or longer, you don't need it as much as you thought. Throw it away or donate it to an organization that will restore and use it. 8. How Many Do You Need? Over time, it's easy to accumulate multiples of items that you don't need, but you feel "wasteful" if you don't keep them. A good example is giveaway items, such as coffee mugs or reusable water bottles. Keep what you truly need and find a new home for the rest. Need help deciding what items make the cut? Our Springs luxury apartment communities offer video and online tours, 3D floor plans and interactive space planners that let you visualize your new home.